This page is maintained by the Certification Board. The information contained on this webpage is for general information purposes only. Whilst we endeavour to keep the information up to date and correct, the Board cannot guarantee the information is free from errors. Please contact the certification board at certification@cagc-accg.ca with any questions or concerns regarding this webpage. *F Program has achieved and maintained Full ACGC accreditation. 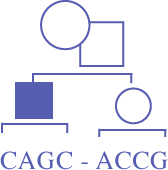 *N Program has achieved ACGC accreditation, New Program status. Please refer to the Accreditation Council for Genetic Counseling for the current list of accredited programs. Please refer to the Transnational Alliance for Genetic Counseling for a list of international programs.